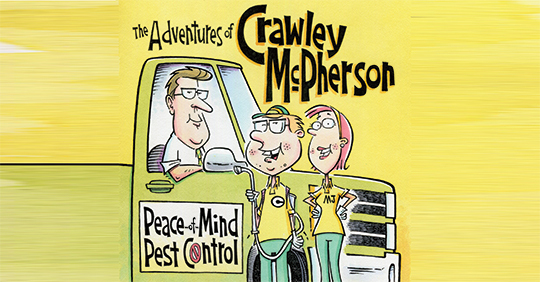 Publisher’s Note: This series — “The Adventures of Crawley McPherson, Bug Man” — is a work of fiction. Crawley McPherson and all other characters in this series are products of the author’s imagination or used fictitiously. Also, all other names, places, locations and incidents are entirely fictional, and any similarity to places or people living or dead is purely coincidental. Ms. Johnson fought an urge to cuss. This had to stop. It was becoming a health hazard that might cause the facility to fail an upcoming health and safety inspection. Surely, somebody could get rid of these pesky gnats. William “Crawley” McPherson, a pest management service technician for Peace-of-Mind Pest Services, got the call about the preschool building from his boss, Jackson Blackwell. Crawley was never deterred by difficult insect problems. In fact, the weirder, the better. He had been a “bug man” for 12 years now and had seen more than his share of bugs, vermin, and all manner of infestations. Sure, Jack had a fancy college degree in integrated pest management from Purdue University, but Jack didn’t know about the intimate lives of insects like Crawley did — where they breed, their secret behaviors, and other mysterious facts that only Crawley would know by his years of detective-like inspections. Today’s situation was a strange one, all right. Jack had told him it was an old government building totally infested with tiny gnats, and he said even though it was winter, various kinds of gnats could potentially breed inside a dwelling. The building was occupied by three different agencies: a health department clinic, the local human services office, and a government-subsidized preschool program. Apparently, the gnat problem had been ongoing since last summer, and other pest management companies had tried unsuccessfully to solve the problem. Upon arrival at the address, Crawley emerged confidently from the truck, donned his service belt containing an array of insecticidal baits and aerosol sprays, and swaggered toward the front door like John Wayne in a western movie, even though he looked nothing like the movie star. In fact, he could easily pass for Barney Fife. That’s what he was all right, a Barney Fife pest man. A professional hitman for bugs. Not that he enjoyed killing things; he considered it an important profession. He liked to think that what he did made a difference. Helped people. Relieved suffering. Even prevented disease. At that, Crawley tried to display his most professional face and knew in his heart he was the man for the job. Yeah, it’s me. I’ll get ’em. Dr. Caroline Whittington, who was a doctor at the clinic as well as director of the building, showed up holding a clipboard tight against her chest. Her face was hard, like that of a drill sergeant. This woman was not to be trifled with. “This shouldn’t take long,” he said, hoping that would indeed be the case. Crawley had to act quickly. He didn’t want Jack or Mary Jane “MJ” O’Donnell in on this case. Jack was the boss of the company, and MJ was one of the other top technicians working for Peace-of-Mind. He had to admit she was good. Her quick wit and stubborn Irish determination were hard to compete with. “Just show me where they’re at and I’ll get rid of them,” he said. Crawley followed her to the kitchen, but it wasn’t just any kitchen. It was the mack daddy of all kitchens. Crawley spent a good 45 minutes carefully inspecting the kitchen and all rooms connected to it for possible breeding sites of the gnats. In the process, he found a mop closet off to the side of the main room. He got down on his hands and knees and inspected the large drain in the floor with his flashlight. He stood up and grabbed a few of the tiny flies darting about, and with a hand-held magnifying lens tried his best to identify them. They clearly weren’t fruit flies. Perhaps they were scuttle flies, which some people called phorid flies. Whatever they were, there were hundreds of them everywhere. He shook his head. This wasn’t going to be an easy come-and-go fix like he had thought. If the drain trap was dried up, the mop closet was certainly a potential entry point. But from where? Was the place on a central sewer system? He placed a few of the gnats in a vial of alcohol for microscopic identification back at the office. He knew that a correct identification could lead to critical information about where they breed and other key facts about their life history. Proper treatment would depend on the species involved. Crawley frowned. As much as he hated to, he would need to go back to the office, identify the flies, and then devise a treatment plan for the gnat problem. And that, of course, would mean having to involve Jack and MJ. It was almost closing time when he pulled up to the Peace-of-Mind Pest Services office. A few service vehicles dotted the parking lot, although many of the pest technicians were allowed to keep company vehicles at their private homes overnight during weekdays, leaving the work parking lot mostly empty. MJ O’Donnell met him just outside the front door. She was smartly dressed in her khaki Peace-of-Mind uniform. The only thing amiss was her hair, being whipped around by the stiff, southern breeze. As Crawley made his way down the hall to the bug examination room, Jack Blackwell emerged from his office, heading straight for Crawley. He was dressed in slacks, an almond-colored button-down shirt, and a wool sport coat. He could easily pass for a U.S. Senator. Oh brother, thought Crawley. Here we go. Crawley turned to p. 333 of his Truman’s Guide, Seventh Edition, and examined Fig. 14.1 to determine exactly what kind of Diptera specimen he had at the account. The place was pretty much deserted by the time Crawley started the identification process in the bug room. He didn’t care; he loved solitude. Just him and the bugs. He had spent many a night looking at bugs in the Peace-of-Mind examination room. They had it set up like a university laboratory, with white countertops lining the walls, hosting several nice, dissecting-type microscopes. In addition, there were two stacks of Cornell cabinets in the room, containing drawers of hundreds of properly identified insects. The reference collection was indispensable to Crawley, because he could always go find a “real” specimen of whatever he thought he had identified. He placed a couple of the gnat specimens under a microscope and opened up the Truman’s Scientific Guide to Pest Management Operations. He examined the gnats’ eyes, antennae, legs, and the size and arrangement of spines on their body parts. These tiny flies were definitely not fruit flies, but he wasn’t sure exactly what they were. He started “keying” them using the diagnostic key described in the textbook, which was essentially an algorithm designed to systematically eliminate choices until you’re left with the correct one. Crawley studied the creatures more closely. They all had large and conspicuous femurs or “thighs,” meaning they were in the insect family Phoridae. He figured as much, based on the way he had seen them land and “skip” along the surface. He had learned that little tidbit about their behavior several years ago. He sat back in the chair. Phorids. They’re probably breeding in organic matter somewhere in or near the kitchen. Then he recalled something else he knew about them. Phorids often are found in sewage leaking from broken pipes under buildings and situations like that. I wonder if there’s a broken sewer pipe near that kitchen? Crawley was on-site at the government building by the time the first employees started arriving. He’d been sitting in his truck since 6:30 a.m., drinking coffee, eating honey buns, and listening to a pest management podcast about the life history of invasive filth flies. He made his way to the kitchen to continue his inspection from yesterday. 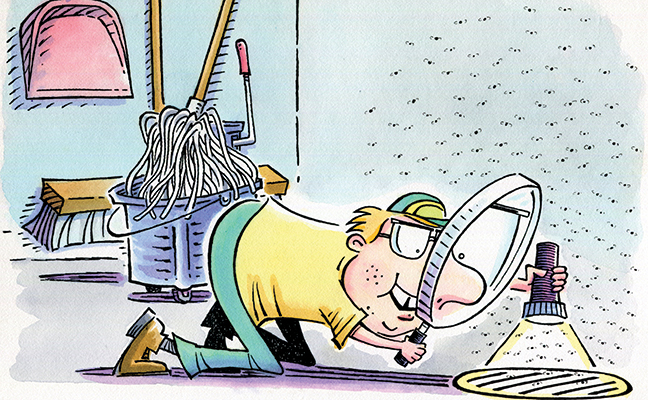 Crawley recalled how he had found the unused mop closet with a dried-up drain trap. Today, he intended to examine the area under the huge three-compartment sink, and especially the drain pipes coming from there. He slithered under the sink on the cold and clammy tile floor, looking for signs of leaks or build-up of scum and gunk in between the tiles. He focused his flashlight beam on the grout between tiles. I’ve seen ’em breeding in cracks like this. Then he inspected the large pipe extending downward from the garbage disposal side of the sink. “Mmm. That could be a clue,” he said softly. Just then, he heard familiar voices approaching the kitchen. Jack and MJ! He slid out from under the sink and stood to meet them. They were accompanied by Dr. Whittington. He tried his best to dust himself, straighten his uniform, and look presentable. “This is where we determined yesterday that the gnats were most prevalent,” Dr. Whittington said confidently to Jack and MJ. Crawley noticed how different the doctor was today with Jack around. She was much softer, even smiling. But one thing was the same: She looked right past Crawley, as if he didn’t exist. Her remark irritated him. We determined? MJ smiled when she met Crawley’s eyes, then nodded toward him. At least she sees me here, working. Crawley tried to hide his surprise. Both Jack and Crawley were surprised at her statement, but for different reasons. “Can we look and see?” He knew this might be a gamble. Outside the building, Crawley tried to line up with the kitchen by looking at the lone small window over the sink. Once he had done that, he stepped back in the yard about 20 steps from the building and started tapping the grass with his foot and scraping dirt side to side. He couldn’t help noticing the others watching him curiously. Crawley saw MJ smile and wink at him. She knows. Momentarily, Dr. Whittington rounded the corner with a burly man following her. After a few tries, the man was able to pry open the lid with a crow bar, revealing a pit in the ground approximately the size of a garbage can. All kinds of pipes entered and exited the hole in the ground, leaving a vat in the middle holding a dark, slimy liquid. A column of millions of tiny gnats suddenly emerged from the soup-like goo, flying up toward the sky. Dr. Whittington and the others stepped back. “But how are the gnats getting back into the building?” Dr. Whittington asked. “Like a mop closet drain.” Crawley displayed a big toothy grin, his eyes looming large inside his thick glasses. On his way into the building, Jack turned back to Crawley and MJ. “I can handle this now. I need y’all to get on with your regularly scheduled routes.” With that, he disappeared into the building with Dr. Whittington. Crawley nudged his glasses back up his nose. Maybe she was right. There were lots of other pest cases out there to be solved. Contributor Dr. Jerome Goddard is an extension medical/veterinary entomologist at Mississippi State University. He is also a PMP Hall of Famer (Class of 2012). He may be reached at jgoddard@entomology.msstate.edu. 1 Comment on "Fiction: Crawley McPherson and the gnat outbreak"
This story may be a work of fiction but I can tell you from personal experience that the gnat problem in GA is epic. But you must descend below the “Gnat Line”. This geographic anomaly is well known to Georgians. There’s even a famous pose: You’re waving your hands briskly back and forth in a futile effort to stop hordes of itchy, buzzing, thoroughly annoying gnats from landing on your face. I’ll bet the author has experienced this and his story will horrify some and resonate with others.